In 1935, King Kong’s creator, Merian C. Cooper, was seeking a vehicle by which to keep his greatest creation alive. Kong was dead. Skull Island had sunk at the end of Son of Kong. But Cooper was undeterred. Harkening back to a pre-King Kong project when he tried and failed to obtain film rights to Edgar Rice Burroughs’ Tarzan of the Apes, the celebrated filmmaker conceived a technicolor prequel he called Tarzan Vs. King Kong. A prequel to King Kong, it brought the Ape Man to Skull Island to confront the mighty Kong. Alas for Cooper and the rest of us, he failed to secure the rights to both properties, and so the project perished. But it was not forgotten. Periodically, attempts to place those two classic jungle characters in the same story were floated, but nothing ever worked out. Until now. Altus Press, Edgar Rice Burroughs Inc. and DeVito ArtWorks, LLC, are proud to announce their version of this long-deferred dream project. King Kong Vs. Tarzan is neither a prequel nor a sequel to any movie, but instead reveals an untold story only hinted at in the published Kong mythology, and never suspected: The incredible tale of the voyage of the tramp steamer Wanderer as she conveyed the chained Eighth Wonder of the World from his Skull Island home to the bright lights of New York City, and to Kong’s eventual downfall. This is a voyage of over 13,000 miles, during which the aging tramp steamer must circumnavigate the continent of Africa, home of Tarzan of the Apes, yet keep Kong alive, fed and under control. When the ship is forced to make landfall, Kong escapes his chains, and roams the unfamiliar African jungle, seeking a way home. Summoned by reports of a giant gorilla larger than any ever seen, Tarzan of the Apes investigates this incredible marauder, setting the stage for the greatest battle royale ever recorded. King Kong Vs. the Lord of the Jungle! The Dark Continent isn’t big enough for both of them…. Prolific adventure novelist Will Murray, who recently revived Tarzan in Return to Pal-ul-don, and previously pitted King Kong against pulp superhero Doc Savage in his acclaimed 2013 epic, Skull Island, is the writer of this monumental project. “The idea came to me one September weekend in 2014,” he says. “It was Edgar Rice Burroughs’ 139th birthday anniversary. Previously Joe DeVito and I had entertained the possibility of sending Tarzan to Skull Island, but the premise didn’t sufficiently appeal to me. Instinctively, I felt the need for a stronger story, so I put the notion aside until that fateful weekend. It hit me then that no one had ever told the story of Kong’s perilous transit across two mighty oceans. Here, I realized, would be an opportunity to unleash King Kong on the Dark Continent, and show him facing new and different challenges—not the least of which would be the legendary Ape Man himself, Tarzan. 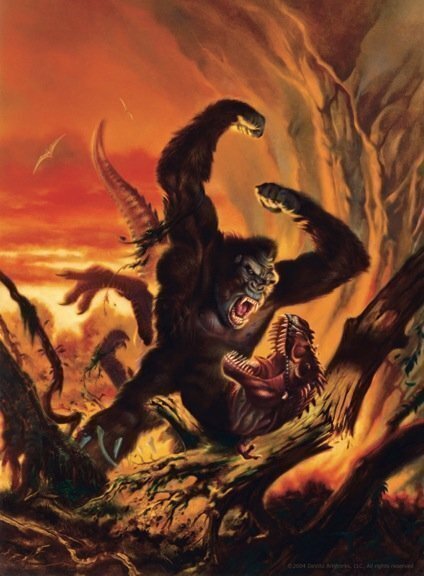 Cover artist/author Joe DeVito writes: “Well over twenty years ago, when I created my original Skull Island property in words and pictures with the full cooperation of the Cooper Estate, I believe it was the first such detailed prequel/sequel expansion ever of the original King Kong mythos. Ultimately, Skull Island was fused with the Cooper Estate’s original King Kong storyline and King Kong of Skull Island was formed to create the ultimate Kong zeitgeist. In addition to so much more, it is ideal for just these kinds of ‘What if?’ explorations. King Kong Vs. Tarzan is scheduled for a Summer, 2016 release, timed to coincide with the promising and much-anticipated new Warner Bros. Legend of Tarzan film, and will be issued in trade paperback, ebook and hardcover editions. DeVito ArtWorks, LLC, is the home of King Kong of Skull Island, which encompasses both the original King Kong story of Merian C. Cooper’s King Kong and its seamless prequel and sequel expansion in Kong of Skull Island through fully copyrighted words and pictures. King Kong of Skull Island, is the complete King Kong-Skull Island origin property, uniquely endorsed with the name of Kong’s creator, Merian C. Cooper, and exclusively authorized by his family’s estate. Founded in 1923 by Edgar Rice Burroughs, as one of the first authors to incorporate himself, Edgar Rice Burroughs, Inc., holds numerous trademarks and the rights to all literary works of the author still protected by copyright, including stories of Tarzan of the Apes and John Carter of Mars. The company has overseen every adaptation of his literary works in film, television, radio, publishing, theatrical stage productions, licensing and merchandising. The company is still a very active enterprise and manages and licenses the vast archive of Mr. Burroughs’ literary works, fictional characters and corresponding artworks that have grown for over a century. The company continues to be owned by the Burroughs family and remains headquartered in Tarzana, California, the town named after the Tarzana Ranch Mr. Burroughs purchased there in 1918 which led to the town’s future development. Altus Press is the world’s largest publisher of pulp fiction. In addition, for several years, Altus Press has published licensed material featuring classic characters such as Doc Savage, Tarzan, and The Shadow for new stories. Altus Press is also the primary exclusive licensee of the vast intellectual property holdings of Popular Publications, Inc., and The Frank A. Munsey Company, comprising an estimated 30,000 individual pulp stories from the 1920s-70s.